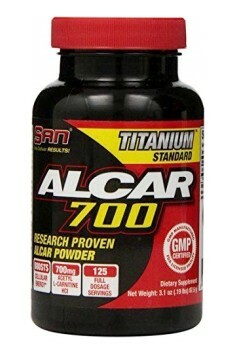 There are various forms of L-carnitine, but SAN’s Acetyl-L-Carnitine is more easily absorbed than the regular form. Acetyl-L-Carnitine is a modified amino acid that supports cellular energy production by assisting in the transport of fat into the mitochondria of cells where it can then be converted into ATP (chemical energy for the cells). In other words, you use your body’s own stored body fat for use as energy! Acetyl L-Carnitine is a highly bioavailable form of L-carnitine, so it’s easily assimilated and beyond just maintaining healthy cellular energy metabolism, it also supports brain function, so you can look good and feel good. Exercise and diet are the biggest keys to unlocking and releasing stored body fat, but Acetyl L-Carnitine is a secret weapon that can help transport that fat into the fat-burning furnace within your cells. Take one portion (1 portion = 1 scoop) 2-3 times a day. 3 portions a day used before meals should meet the expectations of the majority of users. It is best to use on an empty stomach, between meals. It works well before aerobic trainings and before increased mental activity.